By using customer segments you can choose a target segment of your customers or exclude particular customer segments from clients allowed for redemption. While adding validation rules based on segments, you can choose to include/exclude one of the existing segments or create a new segment from scratch. You can also use custom attributes defined previously in Metadata Schema and create unique validation rules based on their values. For example, imagine you have a gym and your customers have different memberships. Despite that Voucherify doesn't have such attribute assigned to customers by default, you can use metadata to put in into customer profiles. By adding property membership to Metadata Schema you can target a specific group of members. 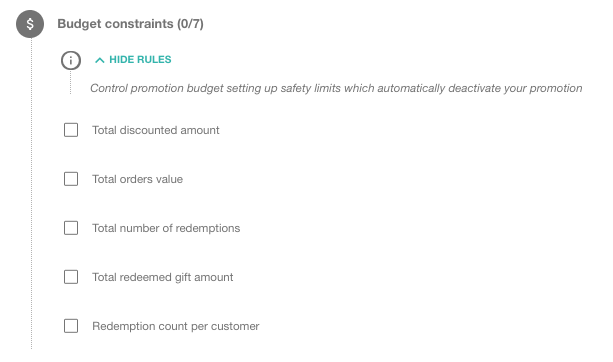 At the picture below, you can see a rule that says only customers with Premium Membership apply for a promotion. There aren't any limits on type or amount of custom attributes. You can define your customers with properties unique for your business. (is/ is not) First property enables you to limit redemptions to specific customer segments. It can be useful if you want to take into account only new customers, or regular clients or any other segments you come up with. Redemption is available if a customer enters a segment "regularCustomers" and redemption is not available for customers who enter the segment "newCustomers". Please note that you have to import your product catalogue to use the rules listed below. Learn more. The last option ' Discount applicable to this order item' defines if the discount is applicable to the added item ( products or SKUs). If you want to discount the product, mark the checkbox. A customer can redeem the code if the order contains at least 3 products X in the cart. Does not contain product You can add the products excluded from the promotion A customer can get a discount only if the cart does not contain product X. 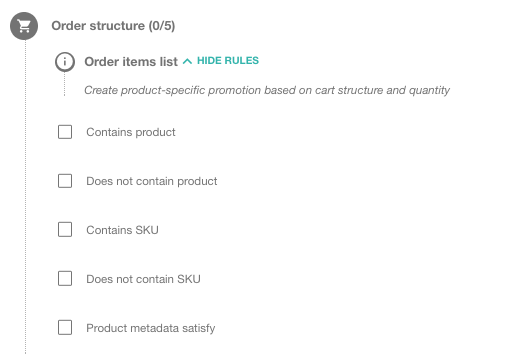 Product metadata satisfy Rules based on custom attributes assigned to your products, e.g., series. You can add as many metadata attributes as you wish. A discount is applicable only to products which series begins from AT54. 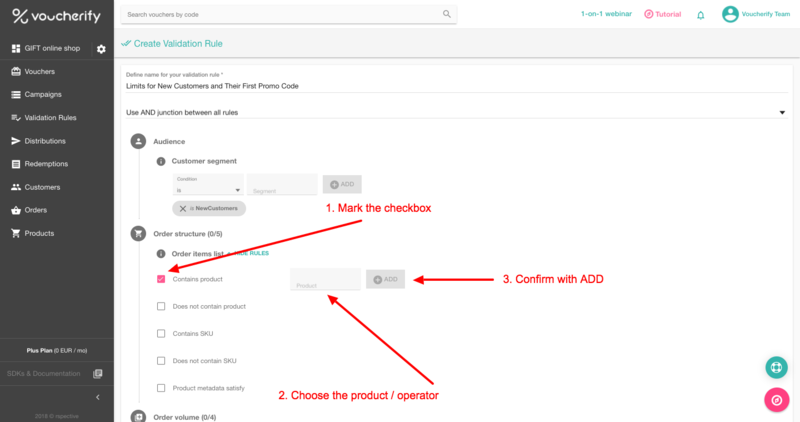 You can define a maximum/minimum value of a customer's cart that enables them to use the code. Discount applies only if the total amount of the order is more than $50. You can select a required quantity (min/max) of products that need to be in a customer's cart. Discount applies only if a customer bought at least 5 products at once. You can set a minimum/maximum price of each product from a customer's cart. Discount applies only if a price of every item in a cart is more than $50. 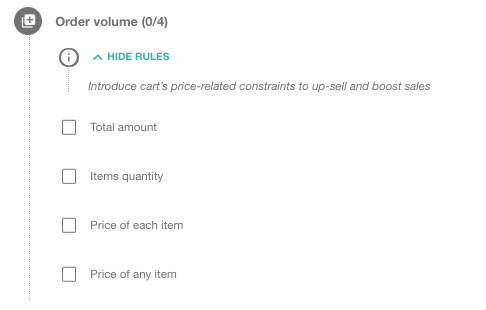 This rule defines a minimum/maximum price required for at least one product from a customer's cart. If a customer's cart contains at least one product for more than $100, the code can be redeemed. It defines the overall value of discount that your customers can get by redeeming codes from a particular campaign. The total value of applied discounts from campaign X has to be less than $10 000. You can select a maximum value of all orders made within the campaign. When this limit is reached, customers cannot redeem more codes. Value of all orders made within the Y campaign cannot be more than $20 000. It's a total number of redemptions allowed per entire campaign. Customers can redeem codes from X campaign 3 000 times. Customers can spend $10 000 of the balance from X gift cards campaign. Customers can redeem max. 3 codes within a campaign but only once per code. With this rule you can manage your team and define which team members or affiliates can/ cannot invoke a coupon redemption User "Denver_department" can invoke redemptions and user "Central_department" cannot redeem codes. With this attribute, you can improve fraud detection and reduce coupon misuses. By using this rule, you ensure that voucher is redeemed by the same person that it was published for (sent). 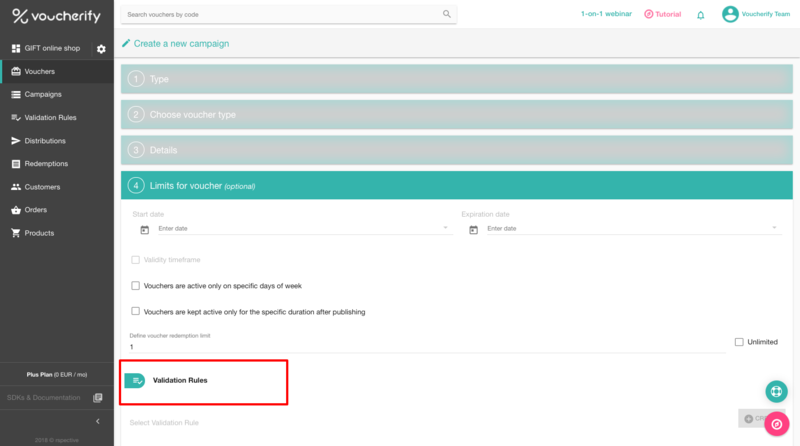 (Once you send a code to your customer through one of the distribution channels, publication details are visible in Voucherify). When you save the campaign and share the codes, a customer will be able to utilize a coupon only if its publication is assigned to his/her id. 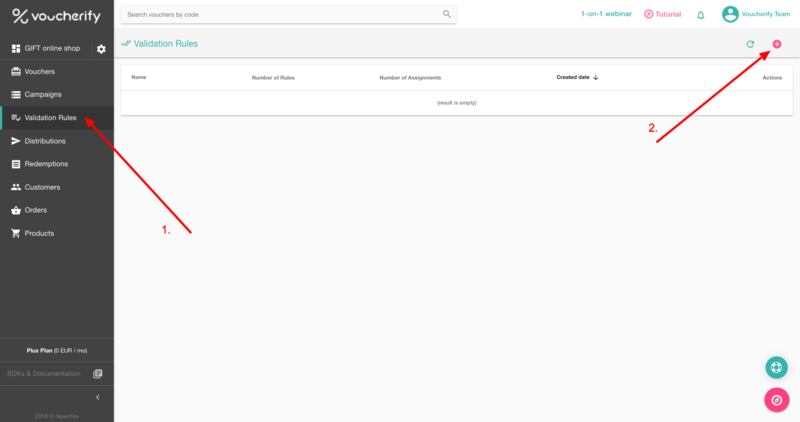 You can build rules and limits in the 4th stage of a campaign creation or in the 'Validation Rules' dashboard section. The flexible mechanism allows you to implement a wide range of promotion ideas. 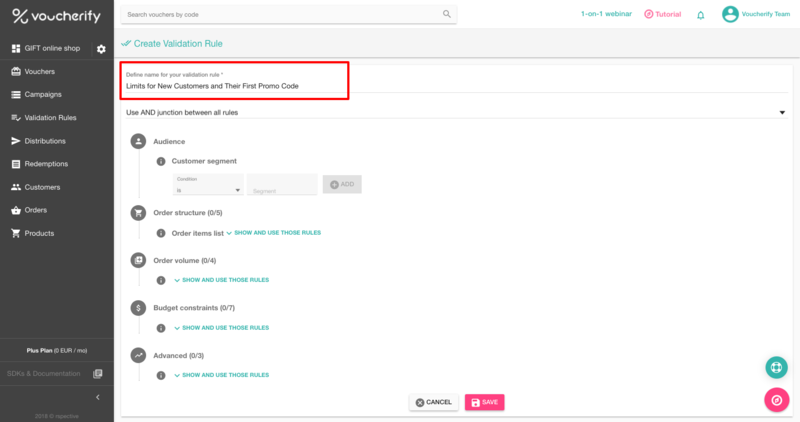 'Validation Rules' section comes in handy when you need the same validation rules in your future campaigns. You can save the rules and add them to any campaign without the need to create the rules from scratch every time. 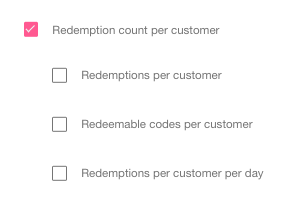 In the 1st category, you can choose a customer segment who can/cannot redeem the codes. To build a rule, you need to add an operator is/is not in the first input and choose the desired customer segment from the list of segments in the 2nd input. You can SAVE each rule or set of rules and use them later while creating campaigns in the Campaign manager. 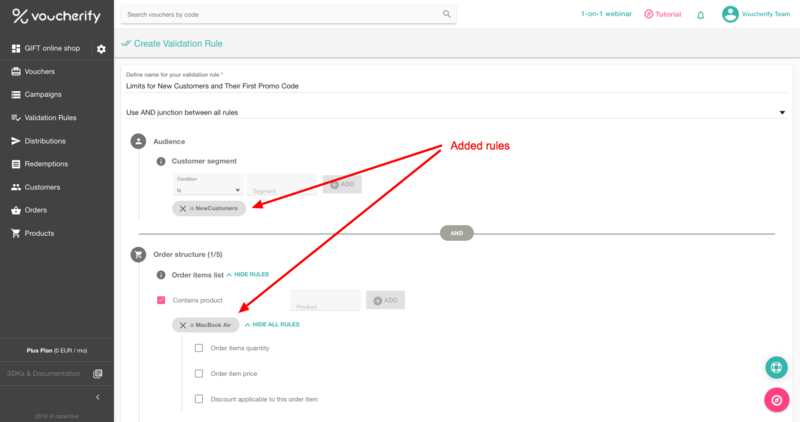 In the 4th step, you can add validation rules and define what criteria customers and their orders have to match to make a valid redemption. 3. Confirm with ADD. All active rules will be visible on the grey background below each category. Some validation rules are based on the structure of products in the cart. Sometimes you want to make a discount applicable only to particular items ( products or SKUs). This can be achieved with the checkbox ' Discount applicable to this order item'. 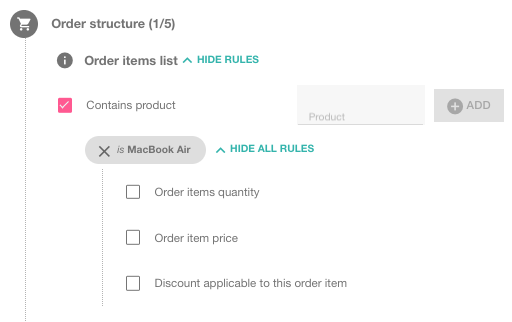 When defining items required in the cart (Order items list > Contains product), you can define separately which of products/SKUs required in the cart will be discounted (or not) when a customer redeems a coupon. When a customer invokes redemption, Voucherify validates voucher and allows for discounting only products with this rule applied (ticked checkbox). This guide assumes you are already familiar with the Metadata - Schema Validation. If you need help on that, follow this link. and 'date time' metadata attributes. 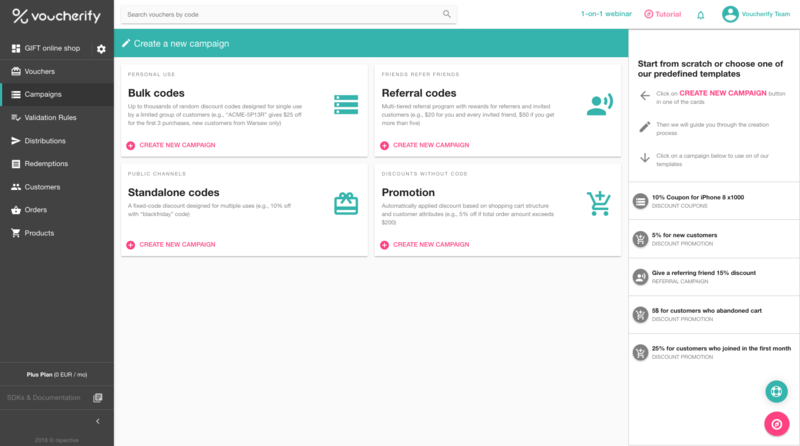 You can use them to add specific campaign limits or customer segment rules. Different types of attributes allow you for creating rules based on specific numbers, dates and time frames. Let's explore some examples. Metadata attributes assigned to redemption objects can be used to create validation rules during the 4th stage of a campaign manager. Let's use them to add validation rules in a new coupon campaign. Rules engine in the campaign manager enables you to set required values of redemption metadata to particular dates, days of the week, timeframes or numbers. 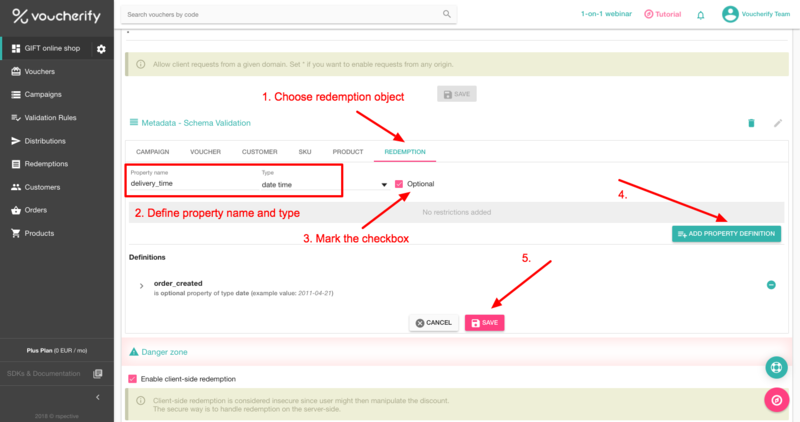 To utilize coupon code, the redemption request needs to be equipped with the required values of redemption metadata attributes. Each custom attribute that you add to product objects using API or Metadata Schema, can be used to create validation rules. You don't have import your inventory to use product-specific rules in your campaigns. That means there is no need of storing products catalog in Voucherify upfront and up-to-date. If you use API to invoke codes' redemptions, then you can add products with metadata while invoking redemption (to the redemption request). You can read more in this guide. When you choose a required value for a property, confirm with 'Add'. 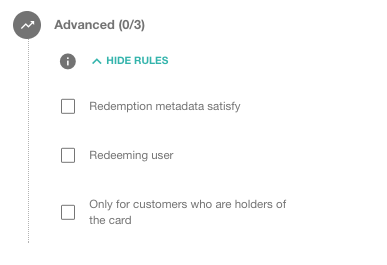 The campaign redemptions will be restricted by added limits and redemption request needs to be equipped with product metadata attributes with assigned values. Otherwise, the system will reject the redemption request.